I'm not sure which way to go on this. As a dyed in the wool new urbanist, I love sidewalk cafes and street trees. The both add signifcantly to the public realm when done right. Which is why I'm torn on the proposal by the owners of Salt Factory to expand their sidewalk cafe. We will get an upgraded sidewalk in that spot, albeit narrower. But, the cost will be the nice little tree that lives next to the road. I'm never the one crying to save a tree when a worthy development comes along but this one gets me. Trees define space and frame a street. I think we will miss the little tree when it is gone and we will have four more tables at Salt Factory. I think they should keep it as it is and add seating on their roof. Strip Malls.. Does Roswell Need More of the Same? It's not easy to do right. Anyone can put lipstick on a pig but it doesn't change the fact that it's still a pig. One of my all time favorites and it might be apt in this case is that 'you can't polish a turd.' That being said, I recently heard that the Holcomb Woods Village shopping center was sold and the new owner is looking to do a little remodeling. I was able to find the plans on the city's website and am slightly disappointed. The first thing I'm going to take up is the name.. please change it. A village is a small community or group of houses in a rural area.. it is not a strip mall with no residents along a major collector highway. Now that I've covered that, let's get back to the plans. 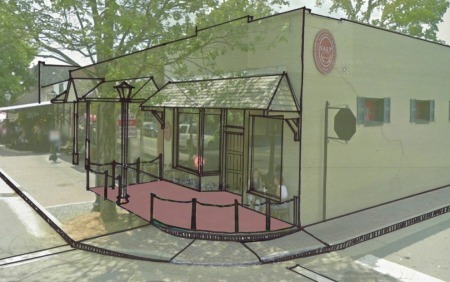 The new owner, Hawthorne Retail Partners, has put together a plan that essentially dresses this little piggy up. Here's the pic... nothing changes in the curent layout of the site. For those readers unfamiliar with the property, it is the strip mall behind Aqua Blue and Wendy's along Holcomb Bridge Rd about a mile east of 400. The shopping center itself is probably about 40% leased (guessing) and isn't in very good condidtion. The premiere tennant currently is Twisted Taco. Most of the property, as with every strip center is dedicated to parking. The outparcels where Aqua Blue, Wendy's and Goodyear sit are not part of the center and they cause a problem because they sit uphill from the shopping center. Thus, drivers along Holcomb Bridge cannot easily see the shopping center. When car traffic is your only source of business, this poses a problem. the owner has three options ranging from cheap to cost prohibitive. Here's a look at each of them. Dress it up... This is the default plan and it looks to be the intent of the company. It is fairly consistent with the Roswell 2030 Master Plan given that this site calls for mixed-use no rise (1-2 stories). Our issue with the plan is that it is essentially adding no value to the city. It may increase the tax rolls near term but in the long run, it is the same retail model that is failing nationwide. In 15-20 years, we'll be in the same spot once again. Looking at an aging strip mall that is half empty. Here's a sample of some remodels Hawthorne has done in other places. Change it up... This will require a little investment and innovation. Create some additional buildings and potentially a gathering space where families will want to come and spend some time. Reaching back into the Roswell 2030 plan, one of the stated objectives for this area is to "seek to create a village environment." A shopping center with the word village in its name does not make this a village. The first thing we would do is shop out the parking lots to an apartment developer and look to bring some full time residents to the area. Think 2-3 stories along the east side of the parcel all the way up to HBR. Internally, consider the Avenue Concept where there is a building in the middle of the horseshoe. Or, maybe a water feature/sprayground where people could sit and hang out. You sacrifice some parking but it could be made up along the periphery with parallel parking. That spot is fairly well shielded from the noise on HBR so it could be a pretty cool spot. The other thing to consider is to look into using the water retention area as a water feature.. it's downhill from the main building where the "wedge" is and could actually look nice. Start from Scratch.. This is a longer term idea. We should be taking the first steps to revitalize the area. It's going to happen incrementally anyway. So, why not start here. Not every city is Alpharetta with a $200M benefactor just popping up to save the day. The first thing that would be needed is to work out deal with current owners of the outparcels. There are too many ideas to list here but someone with some imagination could do something nice. Honestly, it's hard to tell. The one thing we can be sure of is that the market isn't screaming for a new, renovated or dressed up strip center. Sure, Hawthorne will gain some tenants and this will probably encourage the developments surrounding it to redevop to ensure they don't lose their tenants. As far as mixed-use with shopping and residential is concerned, we think there is a market there. There have been proposals made and projects approved on that side of town but nothing has gotten off the ground. That's more of an issue with the types of proposals made (i.e. Charlie Brown) and the timing of the approvals (Centenniel Walk) than an overall aversion. The lot is close to 400. It is near the Big Creek Park. There is a private school within walking distance. A grocery store and a gym within a reasonable walk or short drive. It's walking distance to the largest employer in Roswell (Kimberly Clark). Plus, the redevelopment potential in the area would likely encourage an apartment developer to get into the mix. The parcel sits pretty close to what is the biggest redevelopment opportunity in Roswell... just sayin. So, in our minds, this project could be a catalyst that would jump start the redevelopment of that area but in it's current form, it doesn't encourage much beyond the same 'ol same 'ol strip mall development that we already have for miles and miles along Holcomb Bridge Road. So, the big news out of Alpharetta lately has been the release of the site plan for the new Avalon development. You may want to check out their promotional video as well. Very well put together with the always catchy Temper Trap song Sweet Temptation as background. 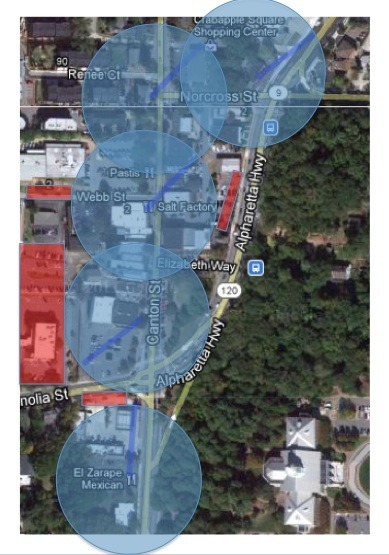 You can comment on the plan here on the Alpharetta City website and Mark Toro will be presenting the project to the public at 7pm on Monday 2/13 at Alpharetta City Hall. Mark seems like a good guy and his presentation will probably be top notch. Unfortunately, I can't make it. Thus far, a well executed marketing and promotional plan. NAP knows what they are doing on the retail side and will no doubt put together a product that will work in Alpharetta. Nice use of terminated vistas on the central avenue. Retail has figured it out, now we just need our transportation engineers and subdivision developers to figure it out. Bold move with the apartments given the current mood in Alpharetta toward anything non-single family. These apartments will be leased with a quickness. Far too much land area dedicated to parking. I hope they are planning on using the space as a land bank for future mixed use buildings. A 14 story building is a show stopper in Alpharetta. Nothing on this property should be go over 6-7 stories. NAP will get some serious backlash if they want to push the height. Does Alpharetta really need another movie theater? Good grief! Also, what will the back end of the movie theater look like from Westside Parkway? Poor use of the detention ponds. Take the Historic Old 4th Ward Park pond as an example of great use of a detention pond. I know.. the site is topographically challenged and the detention ponds can only go in so many places but where's the creativity? Townhomes should surround the park instead of the single family homes. The little park does nothing to increase the value of the single family homes that have their own little yards already. However, the townhomes would see an increase in value. Townhomes should face out along Westside Parkway. This entire project seems to look in on itself. That could be a byproduct of the fact that it is surrounded by multi-lane arterials that not even the most ardent traffic engineer would want to stare at all day, but that's no excuse. They should be designed more like the Lake Deerfield townhomes along Deerfield Pkwy where the buildings on the outside address the street. There is nothing that can help the situation along Old Milton.. you're stuck with a 6 laner + turn lanes. However, Westside can be done well and the right addressing of the street could really change the feel through that stretch of road. The outparcels are very concerning and leave uncertainty. What will be there? They are too close to the residential.. the residential should interact with the main project and not be plagued with uncertainty of what will be developed right next door. Maybe some of these concerns will be addressed and questions answered at Monday's meeting. Either way, thanks to Mark Toro and NAP for bringing life to this project and working to engage the public. What's not to love about good art in your neighborhood? Strolling down Canton Street and dropping into the galleries is a great experience even if you're not planning on buying anything. It's just nice to see great art and talk to people about it. They recently brought back the Art Walk this past October and it seemed to be a big hit. It was successful because Roswell has one of the highest concentrations of quality galleries outside the perimeter. There is a great range good quality art ranging from affordable to very expensive. Honestly, I probably haven't looked hard enough but I'd really like to see one of the galleries feature Roswell themed art. I'm not talking about local Roswell artists. There are a number of those. I'm talking about art that depicts Roswell and our beautiful city. You can find something related to Roswell every once in a while but it can be challenging. We have a lot of picturesque places here in Roswell that are waiting for an artist to memorialize. One last thing.. there are a couple of galleries that have just horrendous awnings along Canton Street. I'm sure there's some crappy code that has to be adhered to as far as awnings and signage are concerned but they just look tacky and hastily done when you look at the rest of the historic district. It symbolizes what Roswell's all about... successful small town retail in the heart of our historic district focused on an outdoorsy lifestyle. They've been around since 1983 which shows that the business is an anchor in the community. It's much more than just paddling with lifestyle gear and actually they probably have some of the best Roswell themed t-shirts around. As we're getting higher and higher on our list, there are fewer and fewer things that we'd change. I'd really like to see them start offering lessons though. You can find people who give lessons in and around Roswell but I'd guess a partnership with GWTF would be a boon to anyone giving lessons. I know that might not be in their business model but novice kayakers need a place to start and why not say you started at Go With the Flow? Oh yeah, I'm not running the business and I'm sure they have their reasons but I'd suggest that they keep the shop open during Alive After Five events. I'm sure the crowds would be a pain in the neck though. The Canton Street section of Historic Roswell has needed a non-restaurant congregation spot for a while and Roswell Provisions has filled the void. The store itself is charming and well thought out. You can get a number of different items for your daily needs. They have a small selection of locally grown organic veggies and fruits. 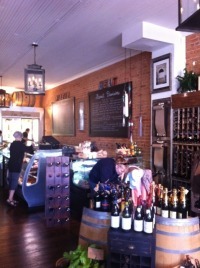 Their dairy selection is all local (albeit expensive) and they have a fantastic selection of sausage, cheese and wine. They have cupcakes from Kelly Cakes and fresh artisan breads. You can sit inside or outside and enjoy the ambiance of the heart of historic Canton Street. The owners took an old underused space in the historic district and turned it into one of the most trafficked shops. It's obviously hit an underserved segment in our neighborhood. Price.. The store is obviously catering to the upscale buyer but man, it's pricey. You get what you pay for though. Everything that I've seen there is high quality and tasteful. Well, it's not Starbucks. What it is, is a fantastic use of a historic building along South Atlanta Street that helps make the neighborhood a little cooler. The Coffee Shop oozes charm and personality. The staff is always great and there is atmosphere with live music on the weekends. Up until the opening of Roswell Provisions, there wasn't really a good, local option for Coffee in the historic district aside from LOATH. They also buy their coffee exclusively from growers in Rwanda and pay higher than fair trade prices for it. You can learn more about those efforts at their website, www.drinkcoffeedogood.com. There's not much we would change about the coffee house itself or the business. However, it is a little difficult to get to on foot and it's at the southern end of the historic district. If I could do anything, I'd move the entire house to somewhere on the square. But, since that's not possible, we'll keep it just the way it is.